Chevron has added a news release to its Investor Relations website. SAN RAMON, Calif., Oct. 18, 2010 (BUSINESS WIRE) -- Earlier today, a group of environmentalists cyber-posing as Chevron officials illegally spoofed Chevron's just-launched “We Agree” advertising campaign, confusing reporters (link). 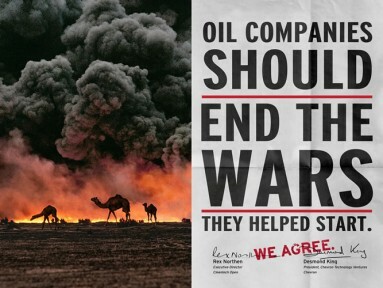 While such a campaign does exist, its official URL is Chevron.com/weagree. The advertisements released earlier today, at Chevron-weagree.com, were an elaborate subterfuge and must not be mistaken as real. “Chevron does not take this attack lightly,” said Hewitt Pate, General Counsel for Chevron. “We invest extremely heavily in our campaigns, and we take them extremely seriously. Such actions can never be tolerated.” Though the exact cost of “We Agree” must remain confidential, Chevron routinely spends $90 million per year on US advertising alone. “We have always upheld the best values of every country to which we are attached,” added Pate. For further information please visit Chevron's official press page. For more information about Chevron please visit www.Chevron.com. Some of the items discussed in this news release are forward-looking statements about Chevron. Words such as "anticipates," "expects," "intends," "plans," "targets," "projects," "believes," "seeks," "schedules," "estimates," "budgets" and similar expressions are intended to identify such forward-looking statements. The statements are based upon management's current expectations, estimates and projections; are not guarantees of future performance; and are subject to certain risks, uncertainties and other factors, some of which are beyond the company's control and are difficult to predict. Among the factors that could cause actual results to differ materially include the ability of the company to divest nonstrategic assets and realign business units according to plan; the length of time required to complete all activities related to the sale; changes in prices of, demand for and supply of crude oil, natural gas and petroleum products; actions of competitors; potential disruptio n or interruption of the company's operating activities due to war, accidents, political events, civil unrest or severe weather; government-mandated sales, divestitures, recapitalizations and changes in fiscal terms or restrictions on scope of company operations; and general economic and political conditions.You should not place undue reliance on these forward-looking statements, which speak only as of the date of this news release. Unless legally required, Chevron undertakes no obligation to update publicly any forward-looking statements, whether as a result of new information, future events or otherwise. SAN RAMON, Calif., Oct. 18, 2010 (BUSINESS WIRE) -- Chevron Corp. (NYSE: CVX) has announced a new global advertising campaign aimed at showing Chevron as a "real people" corporation, and admitting to problems that companies usually try to hide. "We want the world to know that we're just like you and me," said Chevron Vice Chairman George L. Kirkland. "We've got problems and challenges, and we too make mistakes, but we're telling truths no one usually tells, and looking wide-eyed into the future." The candid advertising campaign, created by award-winning long-time Chevron ad partner McGarryBowen, features real people on the receiving end of Chevron controversies in Ecuador, Nigeria, the U.S. Gulf Coast and elsewhere. Each print ad is designed with an authentic pop-culture street-art aesthetic, and features a sincere slogan followed by a big red "We Agree" stamp, the signature of Chevron executives, and the Chevron logo. "Chevron is making a clean break from the past by taking direct responsibility for our own actions," said Rhonda Zygocki, Chevron vice president of Policy, Government and Public Affairs. "Oil Companies Should Clean Up Their Messes," reads one ad; the small print refers candidly to the damage done by oil companies around the world. "For decades, oil companies like ours have worked in disadvantaged areas, influencing policy in order to do there what we can't do at home. It's time this changed." Another ad, "Oil Companies Should Fix The Problems They Create," is just as topical. "Extracting oil from the Earth is a risky process, and mistakes do happen. It’s easy to pass the blame or ignore the mistakes we’ve made. Instead, we need to face them head on, accept our financial and environmental responsibilities, and fund new technologies to avoid these mistakes in the future." "We were asked to show an agreeable, involved, of-the-people face for Chevron, and we think we came up with some really great ways of doing that," said Gordon Bowen, Chief Creative Officer of McGarryBowen. "But what’s unique and different here is the honesty. We've never been able to do this before." "We're telling truths no one usually tells," said Zygocki. "We're changing the way the whole industry speaks." "BP's response to the Gulf tragedy was widely perceived as perfunctory and insincere," noted Bowen. "Chevron has big problems too, like in Ecuador - but they're really stepping up to the plate." 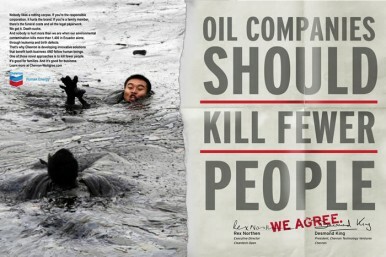 The "We Agree" campaign is an evolution of Chevron's "Power of Human Energy" campaign, which launched in 2007 with a series of print, online, broadcast and outdoor ads that all sought to raise awareness and encourage discussion about the major issues facing the energy industry. Though the exact cost of "We Agree" remains confidential, Chevron routinely spends $90 million per year on US advertising alone. "‘We Agree’ conveys that Chevron is all for people," said Zygocki. "Just as ‘We’ is inclusive, so Chevron is inclusive. It’s time we were on the side of people, no matter where those people are from." Chevron Corporation is one of the world's leading integrated energy companies. The company has about 58,000 employees, and Chevron's subsidiaries conduct business in approximately 180 countries. Chevron operates across the entire energy spectrum - exploring for, producing and transporting crude oil and natural gas; refining, marketing and distributing fuels and other energy products; generating power; designing and marketing large-scale energy efficiency solutions; and commercializing the energy resources of the future, including biofuels and other renewables. Chevron is based in San Ramon, Calif. 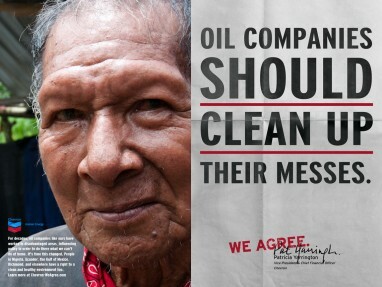 Please visit http://www.chevron-weagree.com for more on the "We Agree" campaign. More information about Chevron is available at http://www.chevron.com. Some of the items discussed in this news release are forward-looking statements about the sale of Chevron's interest in the Colonial Pipeline Company.Words such as "anticipates," "expects," "intends," "plans," "targets," "projects," "believes," "seeks," "schedules," "estimates," "budgets" and similar expressions are intended to identify such forward-looking statements. The statements are based upon management's current expectations, estimates and projections; are not guarantees of future performance; and are subject to certain risks, uncertainties and other factors, some of which are beyond the company's control and are difficult to predict. Among the factors that could cause actual results to differ materially include the ability of the company to divest nonstrategic assets and realign business units according to plan; the length of time required to complete all activities related to the sale; changes in prices of, demand for and supply of crude oil, natural gas and petroleu m products; actions of competitors; potential disruption or interruption of the company's operating activities due to war, accidents, political events, civil unrest or severe weather; government-mandated sales, divestitures, recapitalizations and changes in fiscal terms or restrictions on scope of company operations; and general economic and political conditions.You should not place undue reliance on these forward-looking statements, which speak only as of the date of this news release. Unless legally required, Chevron undertakes no obligation to update publicly any forward-looking statements, whether as a result of new information, future events or otherwise.